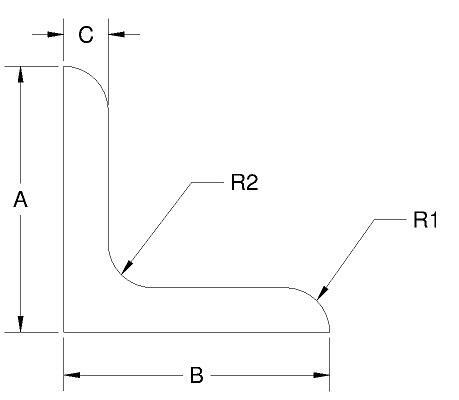 Structural Angles have an L-shaped cross section that is used in many structural applications. Aluminum Wholesalers offers many different sizes, lengths, aluminum grades and specifications for Structural Angle. This type of angle has rounded corners and is generally used for structural applications where strength is important. Structural Angle is typically procured in 6061 Grade which is specified in most any application due to its strength, heat treatability, comparatively easy machining, and weldability. If that were not enough this is also capable of being anodized, adding a layer of protection for finished parts. What sets this angle apart is the rounded corners and the radius on the inside of the 90 giving this angle a far greater weight baring capability. Structural Angle is used in many different industries including but not limited to Road Signage, Commercial & Residential Construction, Aviation, Marine, as well as the Oil & Gas Industries.